At some later the date (to be established) Miss Matilda Drewell, the niece of Charles Marsden, is thought to take over as Postmistress. The Post Office moves to No 25 Market Place where the new Post & Telegraph Master is Eaton Moore. (Charles Marsden dies in 1897 and this may be the date that his niece, Matilda Drewell retires as Post Mistress. Verification needed. (Note: With acknowlegements to Alan Greening for identiying the site of the Queen Street Post Office, and to David M Lee for his article in Southwold Museum and Historical Society Newsletter No 11, June 2011 on Letter Carriers to Southwold). William H Brewer - Hairdressers (K1924) Mr Brewer has a hairdressing salon next door at No 14 as well as at No 10 East Street. 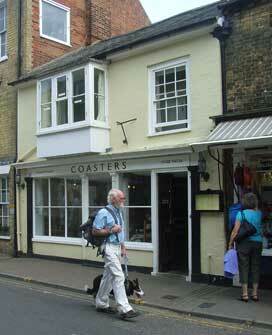 It is possible that he uses the first floor of No 12, the ground floor being occupied by the Misses Kent. 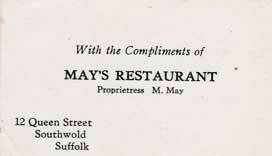 Mrs May G May - 'May's Restaurant'. Albert and May purchase the freehold of the premises in the mid 1960s. Peter Woodward and Oliver Walker - 'Coasters' Restaurant opens in May this year. 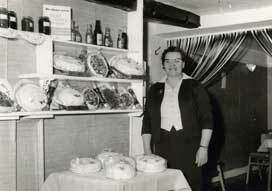 May May in the front of her restaurant at Christmas time 1964, showing off some of her products. Photo by Norman Parker, reproduced courtesy of Gary May. 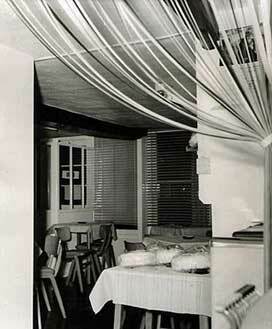 View of May's Restaurant from the back room looking forward to the front entrance. The keys of the old National Cash Register till can be seen in the right-hand bottom corner. Date 1964-5. 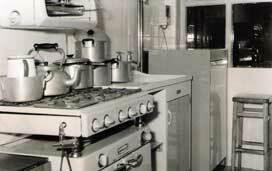 Part of the kitchen showing the six burner, double oven commercial gas cooker and grille. Gary May writes: "My mother did all the cooking here and was very proud of it. She kept everything in this establishment spotless, as can be seen." 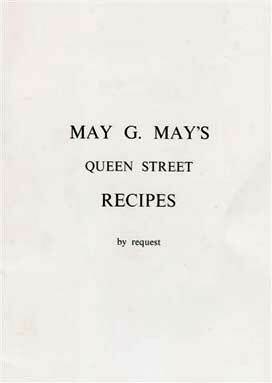 Gary May writes: "May G May's Queen Street Recipes. My mother produced this book of her recipes by request from her many valued and loyal customers. It was extremely well received and many were sold. 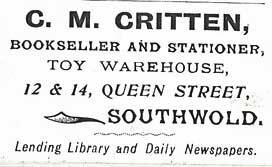 Printing was by Southwold Press, Church Street. Business card for May's Restaurant. Printed by Southwold Press, Church Street. Reproduced courtesy of Gary May.